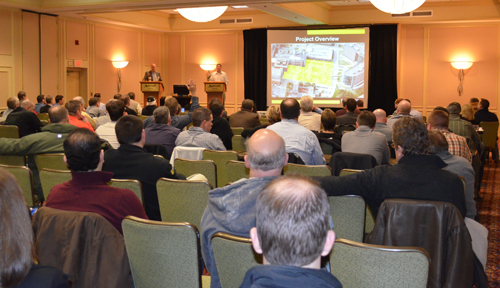 On Jan. 29, subcontractors across the region gathered at the Regency Marriott to hear project and schedule details surrounding the construction of the Fred & Pamela Buffett Cancer Center. Kiewit led the discussion in an effort to communicate the project scope and answer questions about the upcoming bidding process. When it comes to constructing a $323 million facility, there are many considerations. Who will pour the concrete structure that will provide the solid frame? Who will install the mechanical and electrical infrastructure that will protect immune compromised patients and power lifesaving equipment? Who will hang the drywall that will define space and hold artwork for patients and staff to enjoy? That is what Kiewit Building Group, the construction manager overseeing the construction of the Fred & Pamela Buffett Cancer Center, is in the process of determining. Progress continues on project-related utilities, site preparations and deep foundations. Approximately 30 of 177 pilings, which support the building columns, have been drilled and completed to date. Utility connections from existing buildings and creation of new pathways, including electrical, telecommunications, steam and chilled water, are underway. Scheduled interruptions and connections will continue to be coordinated with building occupants. Please be patient as this work is completed, stay apprised of work plans and communicate with your colleagues as necessary. As the eighth largest health care project in the nation currently under construction, this is no small feat. "Not only does this project make an impact on the national stage, it is the single largest construction project ever on this campus," said John Sibley, project executive for Kiewit and construction lead for the Fred & Pamela Buffett Cancer Center project. "Selecting the right subcontractor and supplier partners is paramount to the success of this project." A construction project of this scale is the ultimate exercise in human multitasking, and Kiewit is the choreographer. This project will require an army of specialized experts, each with a unique skill set and purpose. It is anticipated more than 2,000 craftsmen will work on the project with a workforce of 900 on site at construction peak. People will work day and night to make sure the new Fred & Pamela Buffett Cancer Center is ready to open its doors by 2017. Subcontractors will have six weeks to prepare bids for Kiewit's evaluation, but first they will need to sift through 1,600 pages of drawings and specifications prepared by the local project architect, HDR. Contractors will review project specifications, determine the skills and labor force necessary to complete the designed scope of work, and prepare sealed proposals to Kiewit detailing costs. A summary of this pricing will be prepared for review and approval by ownership before the end of March.